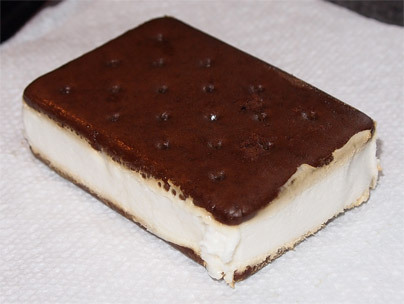 Today, August 2nd, is National Ice Cream Sandwich day. I would have enjoyed it way more had I not slammed my head into the corner of a very large and sharp pointy object. Now don't worry, the very nice doctor says I'll live, so to celebrate the day and my non-concussed victory, I give you a different kind of sandwich. Look, I understand that there is the strong perception that I hate non-dairy frozen products because frankly, that's how things usually turn out. However, that's just a coincidence. If something tastes decent, I'll like it.... I just have trouble finding one of these products I like. and this is a Tofutti Cutie. It's about half the size of a regular ice cream sandwich. Surprisingly, nay shockingly, it ain't that bad. I shoved one in the other morning and instead of spitting it out, I actually ate the whole thing. As part of the Tofutti brand, they are dairy free. As part of the Cutie moniker, these ice cream sandwiches are half sized. As part of my breakfast, I was pleasantly surprised. I know it's not a great shot, but notice that the wafers almost look a bit gooey. This may sound weird, but these wafers with the soy base almost have a cookie dough flavor to it. Maybe it was more of a brownie vibe, but there was definitely something going on. The "ice cream" is very soft, and the wafers are fairly soft, so I think that might have helped that feeling. I hate when the wafers are flavorless, and thankfully that didn't happen here. My biggest complaint here is a lingering aftertaste. It's not horrible, it might even inspire me to have another one to cover it up, but it's definitely there --- though by the second scoop, I was already forgetting about the aftertaste and focusing more on the fact that these things taste like squishy cookie dough. So, let me change my complaint to "why won't my son eat these?" I think he needs a second scoop. 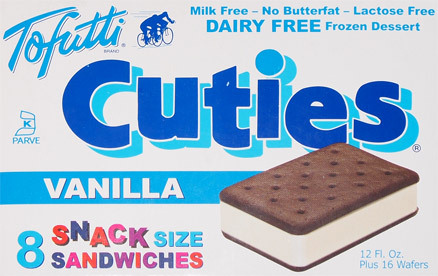 If you are interested, Tofutti Cuties come in Vanilla, Cookies 'N Cream, Totally Vanilla, Chocolate Mint, Chocolate Chip, Wild Berry, and the newest flavor Key Lime Pie. Most places only seem to sell the regular vanilla ones, but if if I ever see one of the other flavors, I'd give 'em a try. Have you ever tried So Delicious Almond Milk "ice-cream" sandwiches? I try to stay away from soy, and have been wondering if they're any good..
Soy is not at all healthy, and I do not like the ingredients in Tofuti, although I never tried it, and do not care to because of these things. does finding old soy-based reviews and pointing out that you don't like soy really make you feel better? what's the point?